The only thing more important than generating revenue from new clients is keeping the revenue stream from existing clients consistent and plentiful. Rebook business is crucial to filling up your pipeline. Just as your retailers depend on you to produce high-quality products season after season, you rely on your retailers to invest in your company year after year. Developing strong, trustworthy relationships with customers helps ensure the revenue flow is fluid. Now more than ever, wholesale has become a two-sided relationship where sales reps and buyers work together to strategize purchases and merchandise products. This newfound partnership gives sales reps the opportunity to build valuable relationships with their retailers. Below are three ways brands can develop long, fruitful relationships with existing clients and drive rebook business. Custom linesheets are a great way to send personalized product recommendations to your retailers. Learn more about the types of purchases your retailers typically place by digging deep into their order history. Spend time looking at trends or gaps in their buying and take action. For example, if you notice a retailer is buying a majority of darker tones for the upcoming summer season, email a linesheet filled with brighter colors like pink, yellow or green to balance out their store. Just as B2C shoppers enjoy receiving product suggests throughout their shopping experience, retailers appreciate when brands take the time to handpick product recommendations for their store. Do your research to show that you understand the retailer’s business needs and are invested in their success, and build linesheets with thoughtful product suggestions that match their style. 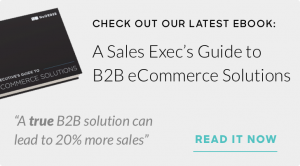 Your B2B platform is a goldmine of data – take advantage of it! Drive demand with your clients by sharing insights on which items are flying off the shelves, which ones are low on inventory, or which ones are just in. By creating a sense of excitement or urgency around your products, buyers will be more inclined to make faster purchase decisions. While diving into your data, you can also pull out some trends that you are seeing and share them with your buyers. For example, if you see that denim overalls and crop tops are hot sellers for the upcoming fall season, let your retailers know. The more you can get your buyers to carry from you, the more important you will become to their store and their success, motivating them to become a strong, long term partner. Consistency is key when driving rebook business. Building depth within each customer account creates stickiness that will keep your buyers around for a long time, so it’s crucial to keep the communication channels up and running. Along with sending linesheets, personalized emails and EZ Orders are great ways to engage your retailers week after week. Follow up with them throughout the season to ensure that their shelves are fully stocked with your latest and greatest items. Find out what’s selling in their store and what’s not, and then offer suggestions. Being a true partner to a retailer is more than ensuring a delivery is on time, it’s ensuring their business can be the best it can be with your products and expertise. 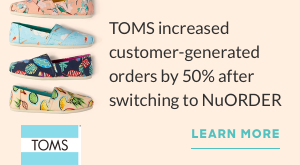 To learn how a B2B eCommerce platform like NuORDER can improve your rebook business, request a demo today.